The Bay Hotel is a distinctive landmark hotel that makes an excellent choice for a successful meeting or residential conference. It is also a very much sought after wedding venue with stunning sea views across the Firth of Forth to Edinburgh. 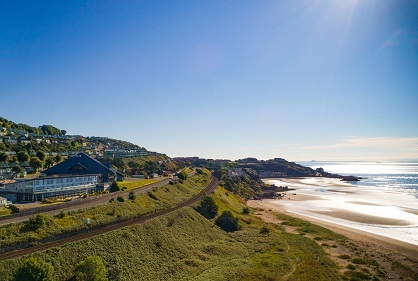 Ideally situated on the beautiful Fife coast, it is easily accessible by road, rail and air. Our purpose-built and stylish function suites and function rooms can cater for groups from 5 to 500. The Ovations Suite has data facilities for up to 12 computers and/or 12 telephone points all of which have broadband and printer access. We can provide catering and state-of-the-art facilities for hosting conferences, team building and corporate events or small meetings. With a range of function suites of all sizes, we can accommodate almost all occasions. At The Bay Hotel we know that planning a wedding is about more than just finding the perfect venue. It’s about making the day memorable for you and your guests. Our weddings are about personal attention from our experienced team at every stage. Our previous wedding clients fell in love with the views and the amazing setting: The River Forth as the backdrop for the day and its changing moods into the afternoon and evening. Our wide range of wedding packages are comprehensive in terms of tastes and options, from the traditional to the more individual. Rarely are special requests too much of a challenge. So, to make your meeting memorable or your special event spectacular, we can create the mood of your choice. For absolute peace of mind choose The Bay Hotel and you won’t be disappointed. All goods and services prices are subject to change at any time and will be adjusted for any changes in government legislation, taxes and VAT. Adobe Reader is required to view the document.